The excitement about Bitcoins, Dogecoins, litecoins, etc. Maybe I'm old, maybe I'm a luddite, but I really do not understand them. Ok, I do understand some of it on a technical level; it's all very clever, and maybe in future the technology will be useful for financial transactions, but what I dont understand is why people seem to think it is money. When people talk about money, 'government issued fiat currency' is practically a dirty word in some circles, especially amongst gold/silver investors. Yet to me, Bitcoins are pretty similar, except of course they dont have the advantage of being legal tender: They come from nothing, are backed by nothing physical, and their usefulness is defined entirely by confidence. Mostly it seems this is confidence that the cryptocurrency of choice can be converted into dollars or similar. I'm sure a lot of early adopters and savvy folk have made money, but that doesn't stop it being any less of a ponzi scheme than any other currency. So what have I missed, why are cryptocurrencies so fantastic and being treated as investments or even a means of saving? What makes them money (or not). Share your bitcoin tales. I'm so happy to see a bitcoin thread here - i didn't dare start one myself One important difference between bitcoin and govt. issued currency is that they have a hard limit on their quantity (as do precious metals) this is a crucial and fundamental property and is why its successful. 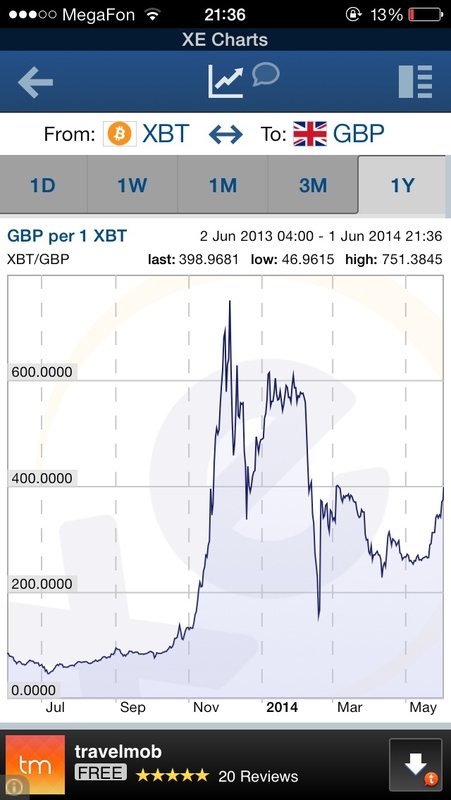 With so many crytocurrencies emerging, they can't all maintain steady rises in value. Bitcoins etc has become so well known even in mass media that I think it's had it's time. For me I have valued the risk on crytocurrencies as too high. Silver is a lot lower risk, silver will unlikely fall and maintain a price below extraction cost for a significant period of time, if it did it would cause mines to close and price of silver to go up. If silver price did crash dramatically (which it already has, so not sure how much further it can crash) m you will always have beautiful silver to look at. 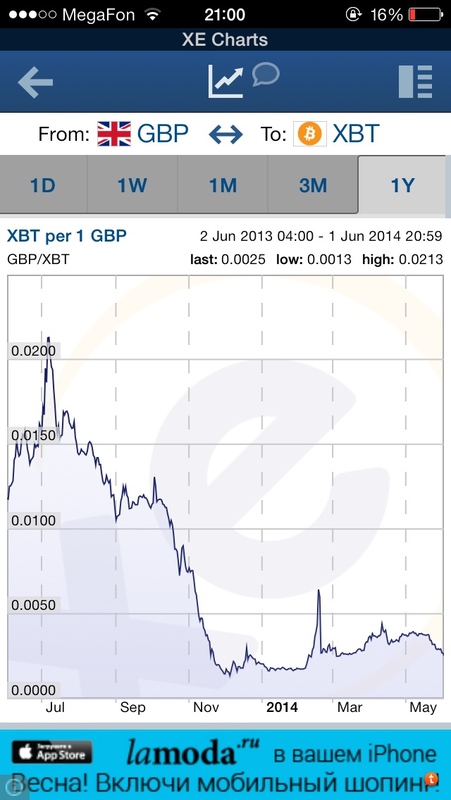 If crypto currency crashes you will only have the chart to look at. Haven't a couple of bitcoin exchanges already gone down with some corruption involved, at least with national governments you categorically know they are shafting you and can plan around that. Ok, maybe I had the graph inverted. First off I love the idea of crypto currencies, cutting out the middle man when making transactions is great, but there are a few problems. I always hear people say bitcoin is just like gold as you can only mine a limited number, but something that never gets bought up is that each one of those bitcoins can be divided into an infinite amount of pieces, so as far as I'm concerned it's not limited. 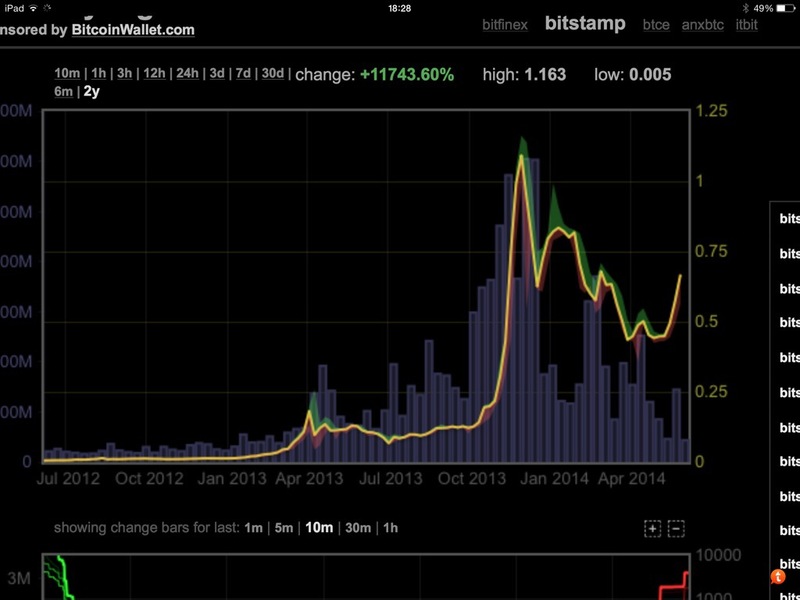 Then earlier this year MT GOX went under losing 750'000 bitcoins, just crazy, I mean where did all that money go? Also we have the people in elite places, if this thing got too big they'd find a way to shut it down, they may even been behind MT GOX, who knows? In my mind it's a great idea with just too many flaws, but saying that if you can make a nice profit then go for it, i have 10 litecoin myself, but one day it will go the same way as fiat, all the way back to zero, something you can't say for real assets. Haha yes I like to know wether I'm being shafted and plan for that . Yes it's true that mtgox went down and lots if people lost BTC and dollars which is horrible for them but the demise of mtgox was very healthy for bitcoin. It seems that it was more incompetence than corruption but the trial is ongoing. There are very safe ways of storing your bitcoins in a way that they are totally in your hands. As I mentioned in another thread I'm happy to guide anyone who's interested and save a lot of time learning how to do it. There are very safe ways of storing your bitcoins in a way that they are totally in your hands. Just make sure you don't loose your offline wallet stored on a USB key. So can you purchase bitcoins with cash at a bitcoin ATM where you live and then purchase silver from using bitcoins? Are there bullion dealers in Europe that sell good priced silver for bitcoins? And what do you loose in transaction costs. Buying silver without having to go through the banking system is nice, but I assume you pay a higher premium to do so? @garthy bitcoin does have flaws but the divisibility is not one of them. On the contrary, its one of it's greatest strengths. -it allows for the so far unknown phenomena of micropayments so that in the future if you like a video on youtube and want to donate you could donate a hundredth of a penny (stingy) that would add up to something for popular videos etc. So can you purchase bitcoins with cash at a bitcoin ATM where you live and then purchase silver from using bitcoins? Are there bullion dealers that sell good prices silver for bitcoins? And what do you loose in transaction costs. no, i wouldnt trust a USB key. there are much better ways. yes you could purchase silver using the bitcoin from the cash machine but i haven't done that. With the machine there is a 7% fee so you'd be losing right there. I mostly buy PMs in person with old fashioned english pounds. What does the silver merchant do with their bitcoins once you've paid? Convert it into government-backed currency again, so he can actually pay his taxes or actually use it? Because apart from being thought of as "cool & trendy" by accepting BTC payment, or maybe sitting on them hoping the value continues to inflate, what good are they? A collection of 1's and 0's brought into existence by a computer somewhere. It seems incredible that people will trade hard assets for something that is no more real than Tesco clubcard points. Hi Dime, well this was obviously gonna cause some controversy eh? Ok I know what you saying but....how do I put this into words? If you were to collect all the gold ever mined you'd have a cube 70ft by 70ft, of that cube governments and banks around the world want to hold a big chunk, then many wealthy individuals want their slice, then there's the likes of us that want our few ounces or grams, after that there's not a lot more to go around, that's what gives gold it its value, everyone wants it but only a tiny percentage can own a piece. Now bitcoin, When every bitcoin has been mined I think there's going to be 21 million, now imagine there's a guy that owns 20,99999 of them leaving just one, now that one bitcoin can then be divided into as many pieces possible to hold the wealth of every person on the planet, everyone can have it and that's why it has no real value, its number can be split to an infinity amount of peices and each one of those peices can hold an infinity amount of money, everyone in the galaxy can own it, it really is infinate, gold isn't. Few got there in the end, I don't expect you to agree with me that's just the way I see it, this is definitely an impossible subject to debate. I agree with garthy on the division of bullion / bit coins. There is only so small physically you can make a piece of gold before it's impossible to practically hold. But if bit coins can be split like it's sounding that they can, than this can be done on an infinite level. You just need to keep adding 0 in font. Divide 1 buy 1 million and you get 0.000001 which doesn't look so small on screen. But try dividing 1 ounce into a million pieces. @silversword. Yes, at the end of the day you have to pay taxes in drachmas or whatever but you can't pay taxes in gold, silver or wine either. In practice most merchants convert to fiat instantly and there are remittance protocols that are already set up to do this so the merchant never has anything to do with the bitcoins. But that misses the point that the value of the bitcoins is the utility of the bitcoin network which has incredible potential as a distributed de-centralised time-stamped ledger that no government or business or organisation can mess with. apart from being able to unstoppably transfer value anywhere in the world for next to nothing, It can provide a personal bank to the 2/3 of the world who don't have a bank account. Wills, trusts, votes, property rights etc etc will be on the blockchain and the blockchain is secured by the network and the network exists because the nodes ( people with ASICS and computers) are rewarded for maintaining it so it's a virtuous circle of utility value and exchange value. @silversword. Yes, at the end of the day you have to pay taxes in drachmas or whatever but you can't pay taxes in gold, silver or wine either. Well, you could, if we are being pedantic, pay taxes in gold/silver - but you'd be a fool to, as most PM coins are worth far more than their face value. Of course in the old days you had to, because that's what money was made out of. As you know, the only way for government to instill any real confidence in their paper notes (and thus replace specie) was to agree to accept them in payment. the value of the bitcoins is the utility of the bitcoin network which has incredible potential as a distributed de-centralised time-stamped ledger that no government or business or organisation can mess with. Maybe i'm a pessimist, but government will always find a way to mess with things, and if they cannot mess with it or tax it, they'll try and make it illegal. @garthy & ChrisSilver. It's not easy to get your head around but this really isn't a problem. It's difficult to understand because we are used to inflationary currencies (dollar, pound, yuan etc) the more you make the less they are worth. Bitcoin is deflationary. if you don't believe me think about this: in free markets things are 'priced in' I.e. The sum of all the people trading and coming to an estimation of value based on everybody's information and consideration of the company/venture. That is: people have already thought about the likely future and any problems. I understand what they are. I understand how to mine them and whats involved. I understand you can make large gains. I understand why people like them. I know a few have become very rich from them. Not saying they are going to bad or anything they are just not for me.